“Pot” Luck for the Giants? Draft insight. First I want to mention that in a report by ralph Vacchiano, it says that the Brows intial demans were Mathias Kiwanuka AND the G-men’s first round pick. Now that idea I like. I think we can replace Kiwanuka, but for Kiwianuka AND a first round pick. I’m beginning to wonder if this deal will ever happen. Jerry Reese has a strong background in scouting, and he really trusts his talent evaluation, and I think the Browns have to come off their asking price IF this deal is to happen. Now, onto the “Pot” luck for the Giants. Of course what I”m talking about is the recent news that Percy Harvin has failed a drug test, it has also come out lately that Percy Harvin has some character concerns, on top of the positive test his draft stock is slipping. I think that’s great. I never wanted the Giants to spend their first round pick on Harvin, but a 2nd? First off if it’s a second round pick for Harvin (we have two), then he doesn’t get a ton of money up front, on top of that it’s not as big of a risk because we wouldn’t take a risk with the other two picks. I think Harvin could be a very nice fit with the Giants, especially if the Giants don’t get Braylon Edwards or Bodlin. If that doesn’t happen that means that the Giants have a huge hole in the return game becuase Hixon will be a #1 or #2 WR and not a return man. Harvn also fills the void Eli has had since Tiki Barber left and that’s a guy who can run a good screen. We’ve tried it with Brandon Jacobs, but he drops the ball (pun intended) too often. 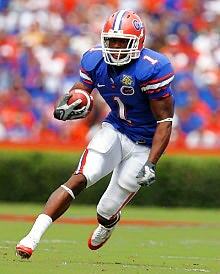 I think Percy Harvin would look nice in Big Blue. And now with his failed drug test, it’s a possiblity. The other player that could help the Giants that failed a drug test is Brandon Tate out of North Carolina. Now, with the failed drug test he may fall to the end of the third or even all way down into the fifth round. At which point he’d be GREAT value for the Giants. So are these failed drug test going to be anything good for the Giants? It means that Jerry Reese seems to prefer players that play at big time programs early in the draft and then to take fliers on players later in the draft. 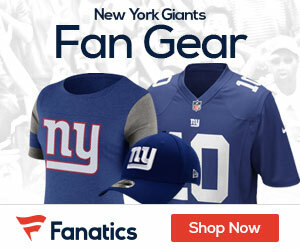 Im’ not sure Kenny Britt, or Hakeem Nicks are big time programs. (Percy Harvin is) Do they buck the trend this year by selecting a player like ramses Barden or Larry Enlighsh? It does make some serious sense. If a player is great in high school to go to a big time program, and then is productive in college at a big time program it seems to reason that they have a better shot of being good in the N.F.L. James Laurianitis if he’s available and go for Hakeem Nicks, Britt, Robiskie, Louis Murphy, Percy Harvin in the 2nd round. To be honest Jesse, and I don’t mean to offend you, but I’ve generally found your articles a bit trite and overwritten at times, but this article is well thought out and with its tasteful use of wordplay it shows real promise. Moreover, I’ve also noticed Reese’s penchant for drafting from big time programs, but more specifically he seems to favor programs with long-standing traditions and high standards for its players. These pro style programs really prepare their players for a professional brand of football probably because the programs are loaded and practice in a highly competitive setting everyday. Therefore, they can come in and contribute right away. Steve Smith running that pick play on third and long during the game-winning drive in XLII beating merriweather to the sticks showed real concentration and poise especially for a rookie and these are the guys that reese goes after. It’s okay I don’t offend easily. I will disagree with you to an extent, I do not think what I write is generally trite-becuase I try to talk mostly about things that most people are not talking about or presenting a different take on things. Perhaps I’m misunderstanding your use of trite though, unless you mean the actual wording in my articles. I do, however, overwrite, which is my biggest weakness in my writings. I should take more time to edit my opinionated articles to filter out some of the garbage that doesn’t need to be in there. I probably post too many drafts. The one thing I’ve noticed above all else is every year Reese has been the general manager we’ve been in the playoffs. So regarldess of what happens on draft day (WR or not) I’ll feel confident about next season. There are a great many people blogging who feel comfortable voicing their uniformed opinions and don’t work hard enough to earn that right. You do yoeman’s work everyday and it’s something I can tell you really enjoy. Keep it up man, I really like the community we have here.